These are good characters. I wish I could draw like that for my characters. So I have this character named Cage Blunt. 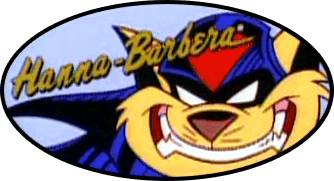 He was not created specifically for SWAT Kats. But he is a character that I very much love and brought him into play during the NSK days. He was then rebio’ed later for SKR. So often when you look thru my art galleries, you will see two different versions of Cage. A cop from my Nightshift comic http://nightshift.poecatcomix.com and then the Cage that was in SK games. You can tell the difference if Cage has Felonykat’s character Cronus Chase by his side. Anyways. 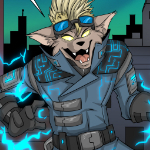 For NSK, Cage did start out as an Enforcer / SWAT Kat. But his personality was neutral. He ended up befriending Felonykat’s Kyle R. Kat. And things just fell apart from there. Cage quickly let himself fall into evil and joined Kyle’s OmegaKats… after all it was natural… for a vampire to be evil, right? The most extreme moment in the NSK world for this Cage, was when Ariakitty’s character Aria came to threaten Cage to ever reveal the SK base, cracking his skull and leaving him a mess. He never did tell Kyle the location of the SK base. In the SKR RP, Cage starts off as neutral / bad / Enforcer. He causes mischief and eventually befriends a mortal named Cronus Chase. He set his eyes on Cronus and made it his mission to make him his. Cage ruins Cro’s life and his own basically thru evil and violence. Cage becomes a villain named Stryker that works for Kyle’s Amrit. Alias: most of the time called Blunt when working. Hair Color: dark brown. His hair is short, a bit wavy, he has bangs that hang in the front. Distinguishing Marks: Darker brown muzzle, ears and tail. Clothing: Jeans, t-shirts, button ups, leather boots and leather jacket. Occupation: He's a nightshift detective for the Enforcers. Powers/special abilities: Cage is a vampire. He has the ability to fly, see in the dark, and increased natural agility. He can heal fast. He has the ability to charm or make people forget…. but its harder to charm those that have a strong mind set. Flaws/weaknesses: Sunlight makes him exhausted and can blind his eyes. He has to wear sunglasses in the daylight. He can't be touched by angels/half angels… they can burn him. The same with holy water and crosses. He must rely on drinking blood to survive and not go into a blood rage. Personality: He is awkward and backward socially… whether he likes you or not, he can have a bit of a smart mouth on him and may use it against you to purposely make you mad… which is to only entertain himself. History: Cage Blunt was born a vampire in the 1920's. He lived with his father for years, living a sort of secluded life away from other vampire kinds and many times, away from mortals. They moved back and forth between West Virginia and Kentucky, James (Cage's vampire father) worked as a miner to keep bills paid…. when their never aging faces became noticed among other people, they would move once again. In the 60's Cage became friends with a mortal named Travis Tackett. The two were usually found together. Eventually Travis finds out Cage's secret…which made Travis pester Cage until he turned him into a vampire himself. When Cage finally turned him, James was not too happy…. but he learned to like Travis. In the early 80's Cage and Travis get tired of living in the solitude areas of the mountains and run off to New York. Once there, they cause havoc and death on the streets as they give into their vampire selves and the blood lust. They killed numbers of people… and were finally stopped when the Watchers caught them and punished them for their crimes. They spent ten years in the pits….which is a the worst form of torture for a vampire to go through. In the mid 1990's they were able to return home to Kentucky, but not allowed to return to New York for a period of 15 years. Travis and Cage had decided to split their own ways for awhile… since the both of them had been getting on each other's nerves for some time. One blaming the other for what happened in the 80's. Cage once again found himself in some trouble in 2010…he met a girl and fell in love with her…. but in an accidental blood rage, he killed her. He ran, this time to the west coast in Megakat City. Where he fudged his way into the nightshift detective unit at Enforcer Head Quarters, with fake yet legit looking paper work. For the last 6 months he's been working at EHQ as a detective. He persuaded his way into working without a partner… which at times, he is partnered up with folks… which he makes it a point to make them angry with him, so they ask to not be partnered with him again. Motivation: He is trying his best to be good. Trying to start over again in a new city and trying to do good and what better way to do good, then to be a cop? In the SKR RP, Cage starts off as neutral / bad. He causes mischief and eventually befriends a mortal named Cronus Chase. He set his eyes on Cronus and made it his mission to make him his. Cage ruins Cro’s life and his own basically thru evil and violence. Cage becomes a villain named Stryker that works for Kyle’s Amrit. Flaws/weaknesses: Sunlight makes he exhausted and can blind his eyes. He has to wear sunglasses in the daylight. He can't be touched by angels/half angels… they can burn him. The same with holy water and crosses. He must rely on drinking blood to survive and not go into a blood rage. Mwhahaha! Kyle corrupts Cage in NSK and Cage corrupts Cro in SKR... must pass the evil stick! OK! A character that was just a side character that ended up being more is Veronica "Roni" Stanton. She is a half demon. In the NSK RP, she fell obsessively in LOVE with Felonykat's character Kyle "Onslaught". She would do anything and everything for him. She became his demon queen and called herself Wildfire. This Roni was VERY crazy @_@ Also... she even began changing her fur color to look like her beloved Demon King Onslaught. In the SKR, she was a good guy that was still half demon. Her alias in this version was Pyre. In this RP she worked as a demon slayer for the Vatican and worked alongside Sage's character Mark. 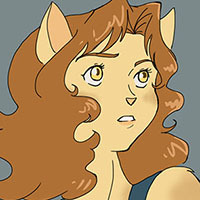 Her demon side began to get in her way after being exposed to all the evil in MegaKat City. And while she didn't become a villain... she began to live and work on that gray line. She eventually became friends with a fallen Angel named Cole (Whom belongs to Felonykat). Which jeopardized her alignment with the Vatican and her partner Mark... whom she began to have strong feelings for. Hair color: light blond, almost white. Her hair has got some wave to it. Eye color: Brown, but yellow when influenced by her demon side. Unique markings. Her ears are more brown then the rest of her fur color....her tail is the same light brown color, but the end is tipped with her ear color. Powers:: Roni knows very little about her demon side, but she is learning. She has some fire powers, which could someday be deadly...but the only thing she can seem to do is manipulate already lit fire...like fire from a candle or match....she can also make fire in a fireplace twirl. When she gets skilled enough, she'd be able to create her own fire and manipulate it at will. She has wings, but she hasn't learned how to use them just yet. She has the normal half demon healing capabilities. She doesn't know how to teleport...but that is a power she'll learn later. Weaknesses: She's unskilled in her demon powers. Personality: Very shy and quiet...which are the type you have to watch for, right? She secretly holds the desire to release herself and dowhat her demon side wants. But she keeps herself locked up and reserved around people...she's got her father's name to keep clean after all. Roni and her father live together in a nice home in the wealthy part of town. John Stanton isn't a billionaire, but sometimes he defends them. John is a lawyer and a dang good one at that. He stays busy most of the time and travels quite a bit. When Roni was around 6 years old, she spent a lot of time with the Manx family...she'd became good friends with their daughter Alexandria "Lex", even though Lex was 3 years older, they remained friends. Roni's mother had abandoned her and her father when Roni was 5 years old. A horrible age to lose her mother. She lived with being told, by taunters, that her mother didn't love her and that's why she left, without a word, without a reason. John Stanton did find some clues about his wife. In a journal, hidden in a secret place within a trunk. Samantha talked about her life, about her beautiful child and loving husband and about the secrets that she never told either of them. She was a demon that was allowed to live among mortals, but only for a short time. She wrote that her greatest fear would be never to see her child grow to a young adult and her fear became reality when she was summoned back into the underworld, never to return to earth again. John kept the journal and hid this information from everyone. He never thought in his wildest dreams that his daughter would physically be affected by having a demon mother. He watched Veronica grow, kept an eye on her and never saw any signs of any strange demon like things. Eventually he began to fear that his x-wife Samantha must have had a mental condition. Schizophrenia or something that made her believe that she was a demon. To him this scenario made more sense as to why his wife would up and leave like she did. Roni is now in the eleventh grade, at one on with best private schools in the city. She's been have a tough time dealing with her own thoughts and changes in her body, at the same time dealing with the pressures of high school. One day while being teased by the great Miss Stacy Powers, Roni almost lost it.... she felt a rage to lash out and attack the taunter, but she quickly decided to run away and to her home. Once there she watched herself in her mirror with bright yellow eyes staring back at her, her claws piercing the wooden table top... suddenly wings rip through the back of her shirt. She cries in pain. She was so glad that her father was gone on a business trip. But to her surprise, Lex finds her. And offers to help her. Which Roni is truly thankful for Lex's friendship. Roni is terrified with the change her body is going through, but at the same time she is willing to embrace it. She has a couple of new friends that she's found to help her. A woman named Star and another half demon like herself, named Kyle. She has found herself really attached to Kyle, since he is the only other of her kind that she's ever met. Alliance: One the border of Neutral and good. Build: she's slim, but has the curves in the right places. Hair Color: Long and wavy cream colored hair. Distinguishing Marks: Her ears and tail are a darker brown color. A faint scar along the right side of her hair line, from the holy water of a baptism. Cross burned scars on her side and back. Clothing: She wears biker outfits…. tank tops, leather pants, leather jackets. She also wears fingerless gloves and a necklace with an upside down cross that is usually found wrapped around her wrist. When at home, she hangs around in loose fitting comfy pants and tank tops. Occupation: Roni is a hunter / spy of sorts for the Vatican. Powers/special abilities: Roni is a half demon and she posses only half demon powers. The power of flight with wings that painfully sprout from her back. She can teleport and use hellfire to create balls of flame. She also has the ability to heal faster then a regular mortal. Flaws/weaknesses: She can be killed if her body were damaged enough. Crosses and other holy ornaments can make her feel repelled or even ill. She can and most times is a bad judge of character. She does wear an upside down cross on her wrist… even with it being upside down, it still affects her… just not as much as it does right side up. When she feels like she needs to be reminded of who she is and whats her purpose, she turns it right side up against herself… as well as other unholy creatures, if she feels she needs protection. She can sometimes be swayed into darker things…just because of her demon nature…but she really tried not to do this. Personality: Roni can seem to be carefree spirit most of the time, until it boils down to good and evil. She finds herself dancing along that gray line often…and usually having to remind herself who she is and what she really wants. She wants to see good done. She is a half demon and half mortal. She believes that both races are superior. She never thinks one is better then the other. She finds herself unique, in that she has to work harder to be a good addition to heavens army. Despite having been told by some that she will never step foot into heaven with her half demon blood. But she believes that her soul is what makes her mortal and that is the key to her existence. History: Born by a mortal mother and a demon father…. she is unaware who her parents even are. She had been told that her mother had forced her way into the church one night as she was about to give birth to Roni. The priest had no time to get this poor woman to a hospital, so he had to help the young mother along with the birth of her child. When Roni was finally born, the mother laid lifeless… she had passed during the birthing process. Father Demi had taken the young baby into his arms to hold her close and quickly realizing that his rosary around his neck was causing the infant great pain…. even burning her flesh. At first, he felt it was an allergic reaction to the beads and metal. But later to find out, during her infant baptism…the holy water burned her along the right side of her head. The church had adopted her… she lived in the orphanage for some time, though she didn't always get along with the other children, she would easily get angered when provoked and once the other children found out that holy ornaments harmed her. They were frightened of her and even used them against her. She found herself later living with Father Demi and a nanny Teenie, who was part of the church. They knew that there was something about Roni that wasn't normal. It wasn't until she was 14 and the first sight of her demon wings appeared. Roni nearly drives herself into a panic, not sure what had happened, what she was turning into and why was she in so much pain. Nanna Teenie heard her cries and forced her way into her room to see Roni and her demon wings…. she called for Father Demi and he arrived shortly. They then realized that this child had demon blood within her. Father Demi and Roni soon made trips to the Vatican where there, they were training mortals and what seemed to be a handful of other supernatural individuals as well, to be an army for the heavens on earth. Roni finally found a place where she felt at home…. and finally felt comfortable with herself. She studied and learned her powers from others similar to her and learned to push back the evil that does live in her. She was even taught to not feel that just because she was part demon, that didn't make her any worse then mortals…. because after all….mortals are sinners as well, until they accept the Holy master above. Aw! I loved how she n Lex were besties in NSK until Roni went crazy go nuts for Kyle. XD Kyle and her made a great pair but I also liked the character dynamics between her and Mark in SKR. I really like Roni's hair. Even though Cage is a vampire, he kinda has a werewolf thing going on with his scruffy/fluffy design. I dig it!